I found quite a few interesting headlines for Eddie Borgo jewelry. Punk Meets Posh! Rebel Chic! After I scrolled through the Fall/Winter 2010 Women’s collection I knew what the title should be…YOU WILL LOVE EDDIE BORGO. We may not be able to replicate the materials but the wonderful shapes he utilizes in his designs…FABULOUS!!! I try not to use too many superlatives…all right…my posts are full of superlatives. 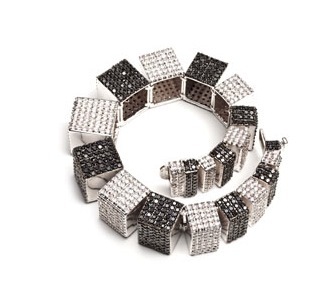 But I LOVED Eddie Borgo’s jewelry designs. If you have time scroll through the collaborations…very interesting. You really have an eye for finding the coolest stuff. I am a customer furniture maker and turner. Hope you will find something really cool in that market. I am always looking for new ideas for my woodworking and writing. Woodturning is soooooooooo cool. I have another blog…whatareyouworkingonthisweek.com. I would love to feature some of your work and the process. I noticed on your blog you go into depth. I try to keep my posts short yet informative. I have two posts coming up…one is a barn in my neighborhood from the 1800’s that will be part of a new community center. The Timber Framers Guild worked on it for two weeks. Another post will feature a company in Scotland that makes fabulous paints. The owner saw The Power of Color and made a T-shirt inspired by the white dress with splashes of color. Thank you for the compliment on ornamental elements. I love the hunt for post material. I would be delighted if you want to feature some of my work. I am working on a project right now call the “Chai-Boy” a take off on the “High Boy” piece of furniture. With this project, I have been posting a daily journal the process, and adding in my personal insites about woodworking and turning. I like to ad humor into most of my work. I majored in being the class clown in college. Put just put a new post about a bowl I completed today. It is short, informative, humorus and is entitled ‘Lil Gem. I hope you might be interested in posting up on your blog.